I’ll be using the Terminal to reset the root password, but first we need to ensure that MAMP’s MySQL server is not running. 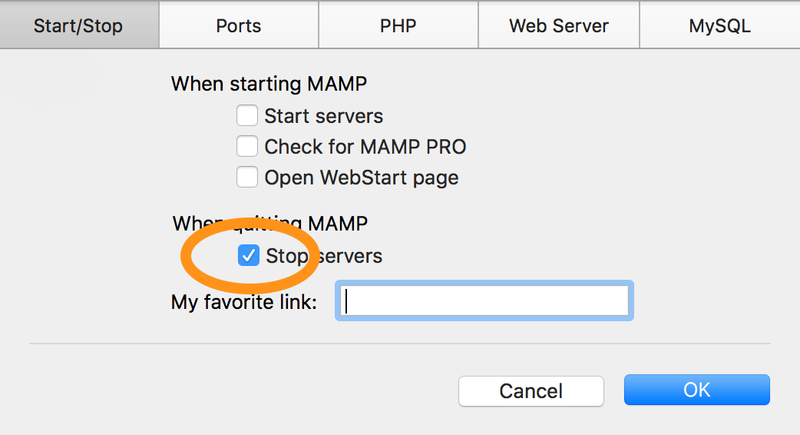 If MAMP is running and the When quitting MAMP: Stop Servers option is checked then quitting MAMP will suffice. If not, click the Stop Servers button. Next, start MAMP’s MySQL server from the Terminal with the --skip-grant-tables option. As this option allows anyone to connect without a password and with all privileges — albeit temporarily — the --skip-networking option is included to prevent remote access. When Terminal displays the following message, press ↵ again to return to the Terminal prompt. You should be returned to the Terminal prompt. 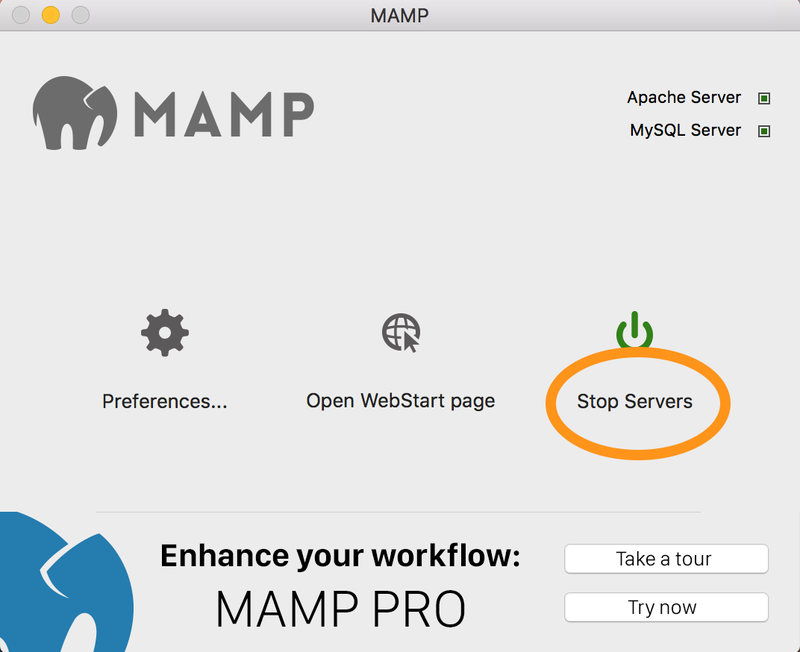 Copy and paste the following command to shutdown MAMP’s MySQL server. You’ll be prompted for the new root password when you press ↵. Having reset the root user password you should follow the instructions here regarding updating the necessary files in MAMP with the new password. These instructions were adapted from the official MySQL documentation. 1 As of MySQL v5.7.6 the PASSWORD() function has been deprecated. This doesn’t affect the current version of MAMP – v5.01 released 2018-08-01 – which uses MySQL v5.7.21. Just a note that mamp pro 4.5 has a “change password” button which is enabled when mysql is shut down. dacdeMacBook-Air:bin cissy$ 170903 12:39:24 mysqld_safe Logging to ‘/Applications/MAMP/db/mysql/dacdeMacBook-Air.local.err’. This will direct any errors to the named file circumventing the file /Applications/MAMP/db/mysql/dacdeMacBook-Air.local.err and may help determine if it’s simply a permissions issue or something more sinister. Don’t forget to change <your user name> to your user name. thank you, but there still lots of error, I think I need reset…. Sorry to hear you’re still having problems. If you’re thinking of re-installing MAMP, you might want to copy any MySQL databases you’ve created. These can be found in either /Applications/db/mysql or /Applications/db/mysql56 depending on which version of MAMP you’re using. Simply drag either of these folders to your Desktop. You can copy it back once you’ve re-installed MAMP. Very useful and straight forward! Thank you so much! This doesn’t work on a Mac. So, there is no way to know or change the root password. QED. Works perfectly on my Mac running 10.11.6. The problem is there are syntax errors in the command you pasted in your comment that’ll give you the exact same errors you’re receiving. Note that two leading hyphens are required and not the one hyphen as in your command. --skip-networking not –skip-networking and so on. I entered the command with “–” instead of “-” and encountered the same issue. I also tried running it with sudo leading it. Is it still not working. Does anyone have a fix when encountering this issue? In the version I was using – MAMP 3.5 – the MySQL version is 5.5.42. In MAMP 4.1 the MySQL version is 5.6.34. [Warning] You have forced lower_case_table_names to 0 through a command-line option, even though your file system ‘/Applications/MAMP/db/mysql/’ is case insensitive. Setting --lower_case_table_names to 0 configures MySQL to use case sensitive table names. However, macOS Sierra and previous versions of OS X by default use the HFS+ file system which is not case sensitive, hence the warning. 4156 [ERROR] The server option ‘lower_case_table_names’ is configured to use case sensitive table names but the data directory is on a case-insensitive file system which is an unsupported combination. When starting MySQL via the MAMP GUI the MySQL system variable lower_case_table_names is set to 2. --lower_case_table_names option or include it with a setting of 2; --lower_case_table_names=2. I’d probably choose the former. Either way you’ll be able to start the MySQL server from the command line and reset the password. I’ve amended the instructions to reflect this change. Having the same troubles as Steve, but from copying and pasting exactly what you had in the tutorial. Somehow, I changed the MySQL root password in MAMP and now I am locked out of localhost. I can’t connect via localhost at all and I can’t access by databases. I have Googled information on how to reset the root password, but I have only been able to find information on MAMP for MAC. I have MAMP for Windows. What are my options, if any? I appreciate any help you can give me. Thank you. I have a Windows 10 system. For some reason, I can’t move past the skip-grant-tables command. When I paste it into my terminal window and press ‘enter’, it returns “the system cannot find the path specified.” What am I doing wrong? According to this document MAMP for windows is installed in C:\MAMP and not /Applications/MAMP as it is on a Mac – hence the error message. I have no experience using MAMP on Windows but I assume to start MAMP’s MySQL server from the Windows command line you’d need to replace all occurrences of /Applications/MAMP in the command with C:\MAMP. Been struggling with this for days. You deserve an Oscar. You just saved my life. Thank you. Very helpful post! I ran into these issues when conflicts arose between my MAMP package and my Mac server instances of apache and a prior installed standalone instance of MySQL. Helped with finding the path to MAMP running things again. You are a life saver…I am a mediocre programmer and i almost ripped my hair out for this. BOOKMARKED!!!! This really helped my. Tons of thanks. Thanks! This just saved me TONS of grief! Thank you very much for this article. Helped me. Thanks a bunch, the config file from mamp didnt work for me. this did! Thank you very much!! It nice solution it solved my problem! Thank you very much!!! You are my hero today!!! Thank you so much! Simple explanation. Thank you so much. This was a real timesaver. Thanks so much for this Steve. You’re a scholar and a gentleman! Thanks John. Glad you found it useful. Took me a few minutes to solve an hour long headache. Thank you! Nice Solution! It the one that solves me the problem! Regards! Hello Steve, I tried your solution, it first didn’t work and then after quitting Terminal and opening it again. At the first step I got this: “mysqld_safe Logging to ‘/Applications/MAMP/db/mysql/MYCOMPUTER.local.err’. chown: /Applications/MAMP/db/mysql/MYCOMPUTER.local.err: Operation not permitted”, but then with “mysqld_safe Starting mysqld daemon with databases from /Applications/MAMP/db/mysql” as you wrote. Was unable to replicate the error in this situation, but got the same error message when using /Applications/MAMP/bin/startMysql.sh then /Applications/MAMP/Library/bin/mysql. If MAMP’s MySQL server was running I’d expect to see the file mysql.pid in the /Applications/MAMP/tmp/mysql folder, but it wasn’t there. Not sure why this happened, but in this situation a simple computer restart fixed the issue. Thank you so much Steve for your answer and your helpfulness ! It first did not work and I had to do it again, start Disk Utilities programm to repair the Mac autorisations, restart the computer, and the same again. After a while the conection to MySQL server worked finally, a big surprise! …But very shortly then came error 2002 ! Then again Disk Utilities and restart, now it works !!! Glad to hear you’ve got it working. Killed the processes myself and everything worked. Thanks for the post! As the error implies the MySQL user doesn’t have SUPER or SHUTDOWN privileges in order to shutdown the MySQL server which seems odd if it’s the root user. I have no suggestions other than using kill -SIGTERM pid-of-mysqld-process in Terminal which worked for you. I’m not sure if you’re still following this comment thread, Steve, but I’ve got a quick question: when I get to the last step of your guidelines to enter the new password in the ‘Enter Password:’ line, Terminal won’t let me type anything. It’s like it is frozen. When I press enter it gives me the error: ‘Access denied for user ‘root’@’localhost’ (using password: YES)’. Any thoughts on why it won’t let me enter my new password? In Terminal the cursor will not move when you enter the password. This is normal behaviour. Brilliant, thank you so much! After an hour of trying to reset my password this sorted me out. You’re a good man. Thanks. Have made the necessary corrections. Awesome! I was trying other solutions and this is the only one that actually worked. Simple copy and paste solution! It was the only thing that solves my problem, of connecting to mysql server. Just spent around an hour before I came across your site. The tutorial got me up and running in about 5 minutes! I was struggling all day with this issue — “error: 1045: Access denied for user ‘root’@’localhost'” — only your solution got to the root of it! Thanks a lot!